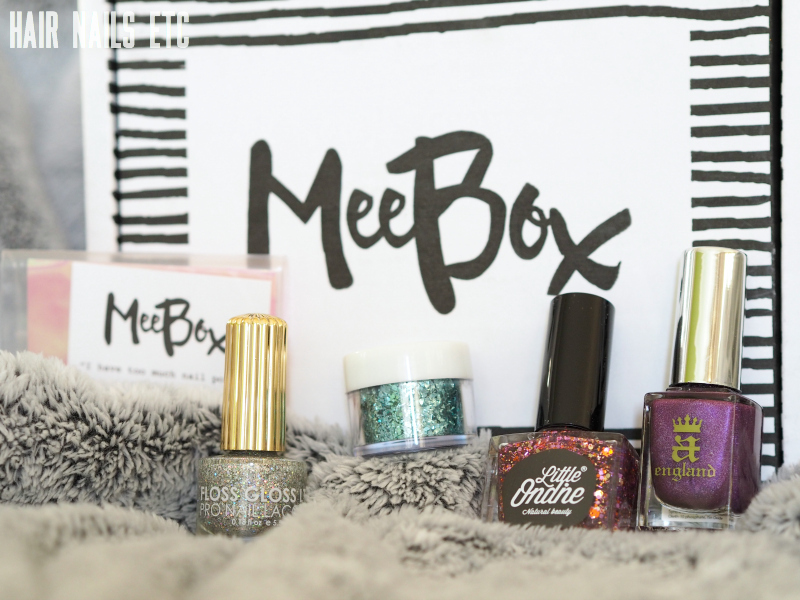 The December Meebox features 5 festive and glittery nail products; 3 gorgeous nail polishes, a pot of loose nail art glitter and some iridescent nail art foil. I am absolutely in love with this edit, the glitter theme could not be more perfect for me, especially for the Christmas season. But even better than that, all these brands are completely new to me: I've lusted after A England's holo polishes for years but never taken the plunge, Floss Gloss I've spotted on Instagram before but had no idea it was available in the UK, and Little Ondine's novel peel-off polishes (as far as I know) are still fairly new so I haven't seen much of them before. 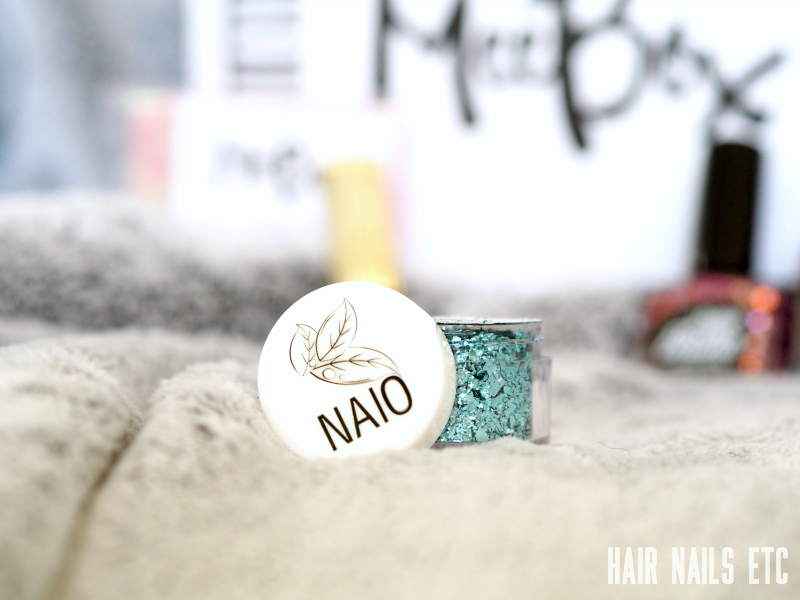 I hadn't even heard of Naio but their website sells lots of lovely nail art accessories which I'm keen to explore. 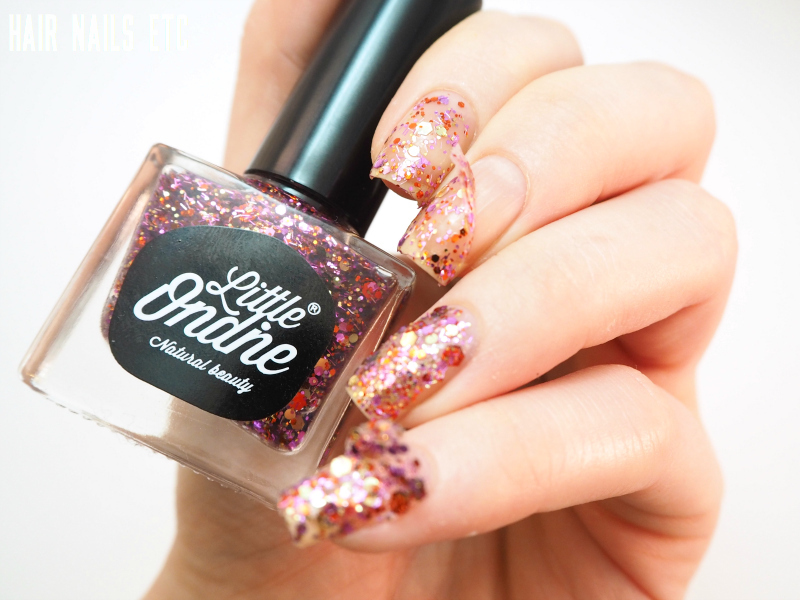 A dazzling mix of pink, orange and gold glitter pieces in a clear base. Anyone that's met me before will know I love pink and orange as a combination, they're probably my favourite colours, so this is spot on for me. I'm wearing two coats on my first and second fingers, just painted normally to show the level of coverage you get out of the bottle. Then on my ring finger and little finger I've added a couple more coats using a sponge, the idea being to pack the glitter more densely. In this case I actually preferred the normal application method, I think this polish works quite well when you can see all the different shapes and sizes on the nail, rather than piling them on top of each other. Obviously you could completely change the look by using it as a topper over different base colours. Plus the magical feature of this polish is it peels off! You don't need to use a base coat, I just painted straight onto my nail and when I was finished I managed to lift up the polish from the edge and peel it off in one piece - very nifty. 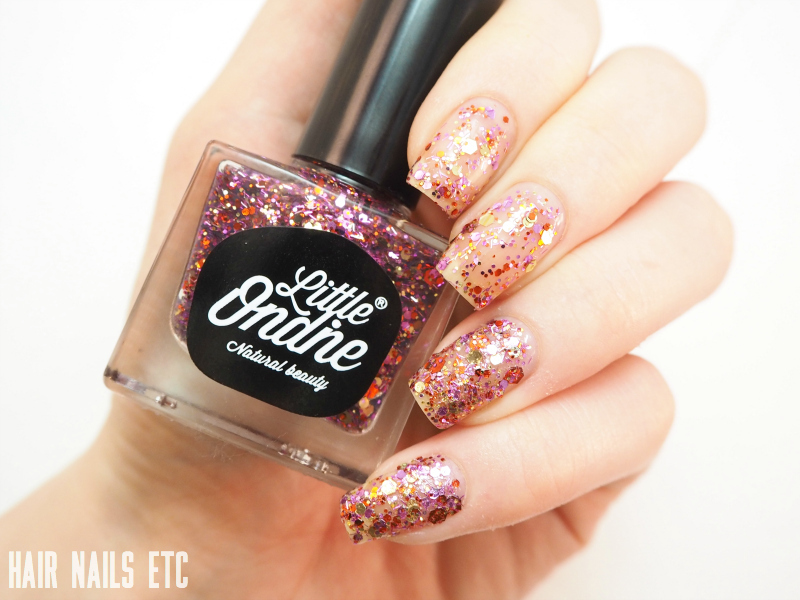 This is one of those things that you didn't know you needed until you get it, and then you wonder why all glitter polishes aren't like this, it really does make removal so much easier! Little Ondine also gets a bonus point for the complete absence of chemically scent - it smells like nothing! This was a bit unsettling at first but it's actually a very nice feature and I believe it's down to all the natural ingredients they use in their polishes. 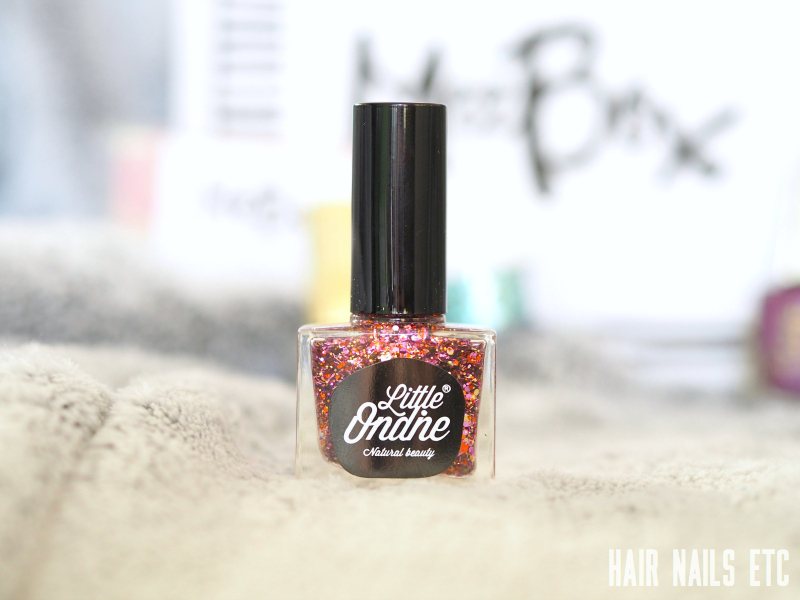 If you're someone who's put off wearing traditional nail polishes because of the strong smell or the tedious removal process then I strongly recommend you check out Little Ondine. 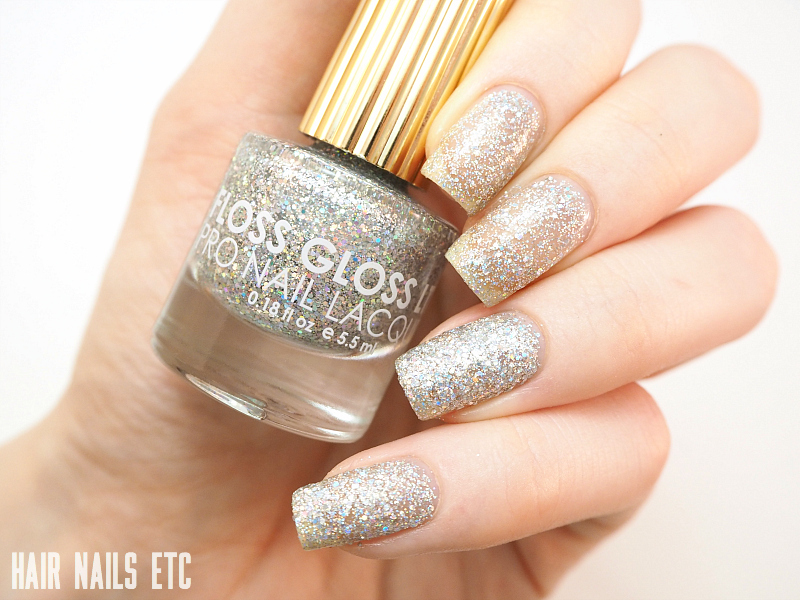 An absolutely delicious holographic silver glitter. Again I'm wearing 2 normal coats on my first two fingers and 3 coats with a sponge on my ring and little finger. 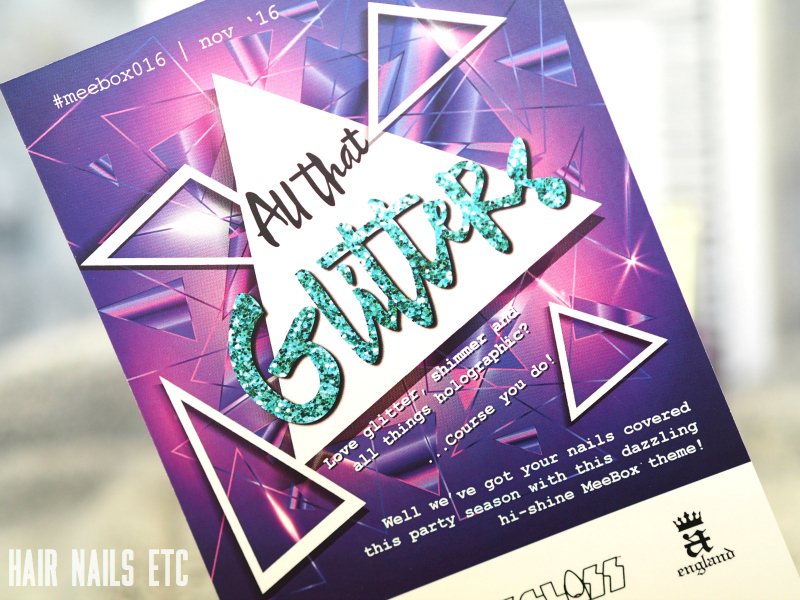 The glitter is quite densely packed, I'd say you definitely don't need to use a sponge, you'll still get an intense sparkly, holo effect. Using the sponge does give you that extra bit of coverage and lets it dry quicker but you do have to do a bit of clean-up so... There's a couple of different sized glitter pieces in here, and you get an amazing holographic effect when it catches the light - I'm so sad I wasn't able to capture this properly on camera but believe me it's there! Also, think we really need to appreciate the beautiful bottle, would love to have more of these in my collection. Yes that's right, just 1 coat. I couldn't believe it either. 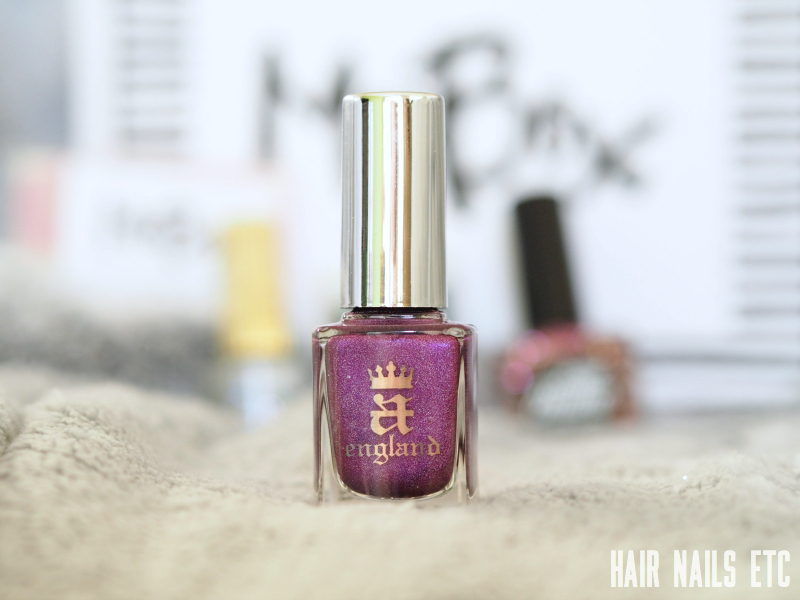 Crown of Thistles is a rich purple polish with a fine silver holo shimmer throughout. 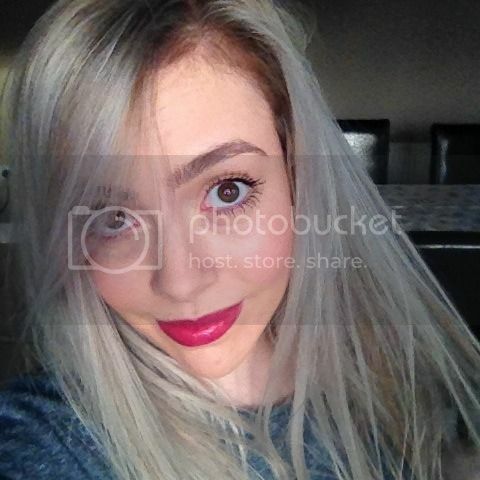 The pigmentation is incredible and the formula was so dreamy. I really wasn't expecting this, you can tell because I was a bit uneven around the cuticle thinking I was going to neaten it up on the second coat but I realised it just didn't need it. The holo effect is quite subtle here, but this is a more elegant and regal polish so that makes sense. It feels really luxurious and certainly makes me want to try more from A England. This little pot is absolutely filled to the brim with glitter. Naio describe it as Cracked Ice Mylar which I think refers to the uneven cut of the glitter pieces. I don't use loose glitters very often, simply because I don't have very many and they're a bit fiddly to use. I love this colour, and I'm looking forward to creating some fun nail art with it. Again, I haven't tried this out yet but I'm already picturing a cool shattered-glass effect with this nail art paper. Not something I've used before but fortunately Meebox have included some instructions and it seems fairly straightforward to use. This pinky iridescent effect is one of my favourite things, if someone could turn this into wallpaper that would be ideal! As you can probably tell, I'm very pleased with the December box! 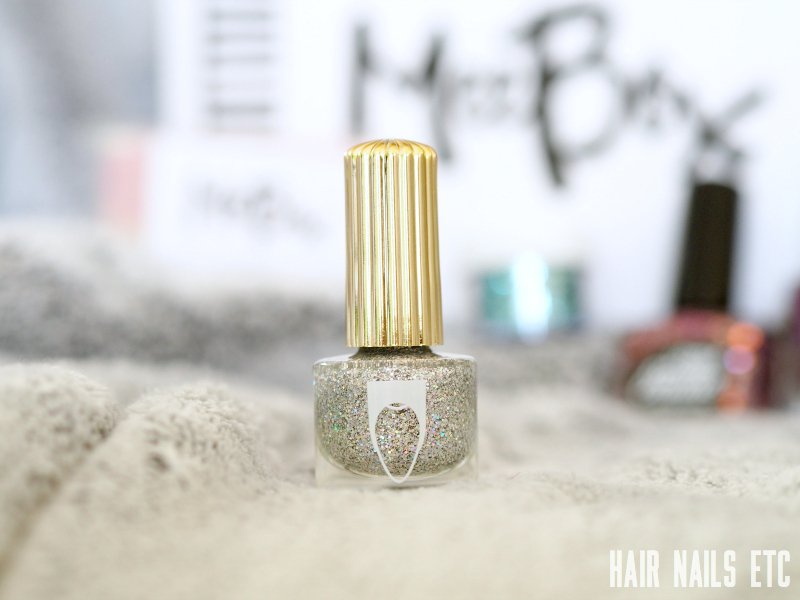 As someone with quite an extensive polish collection, it's so lovely to discover all these new brands, and the glitter theme is perfectly Christmassy without using the traditional gold and red cliché. 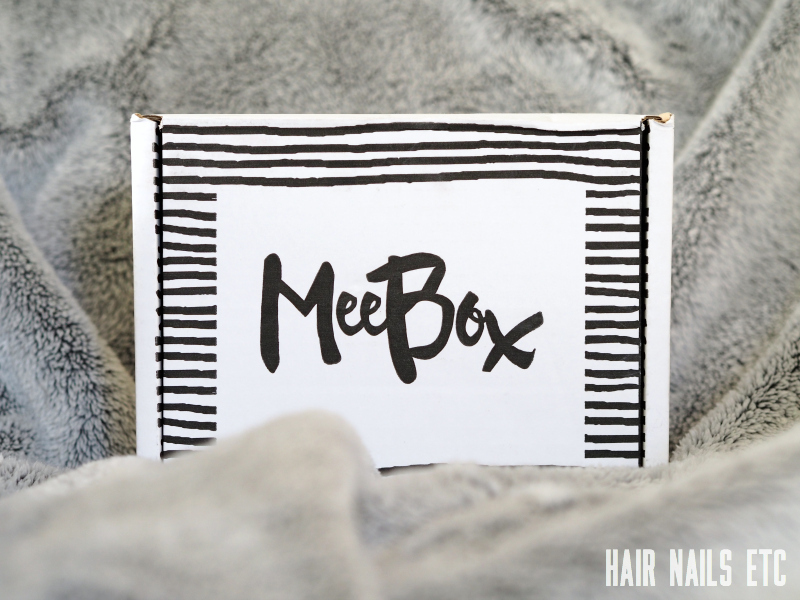 Meebox boxes are available to buy as a one-off for £20, or you can sign up to a 3 month subscription for £54 (£18 per box). The total value of this month's box is £32.50, so you get a decent saving as well as a lovely surprise. 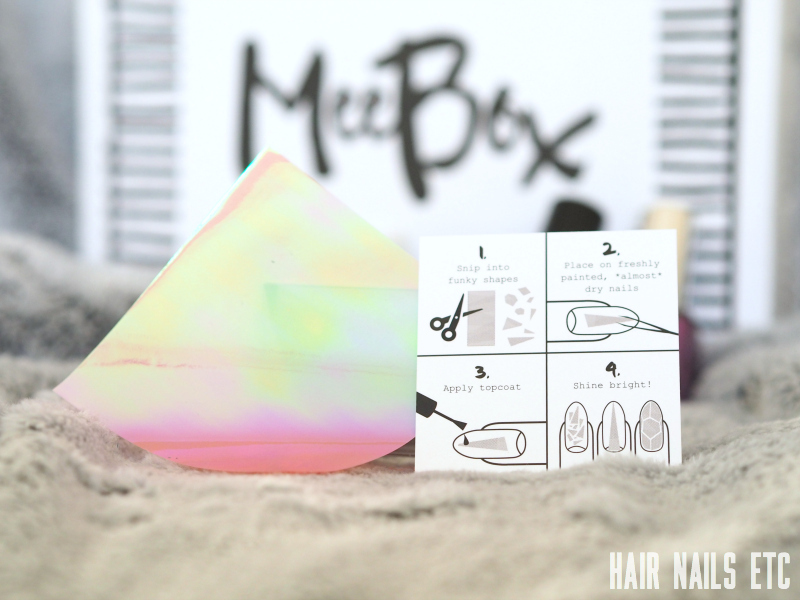 Would definitely make a great gift for any nail polish enthusiasts! Glitter things are in my opinion really attractive and make people look at them even if they don't want to. By the way nice way to give the review and keep posting. Style patterns change now and again and there is no closure to the creative nail workmanship structures and adornments that are utilized to enhance nails. Each lady is entranced by the most recent in design and needs to stay aware of what's in style.